Masks and beads represent the celebratory nature of Mardi Gras. 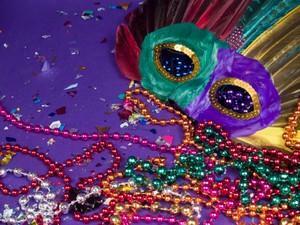 The meaning of Mardi Gras, translated from French, is literally "Fat Tuesday." However, it holds much greater meaning, both as a religious observance and a cultural phenomenon. In the Catholic tradition, as well as in some Protestant faiths, the period preceding Easter is a time of fasting and repentance known as Lent; it begins on Ash Wednesday. Fat Tuesday was created to be a last celebration before the sacrifices ushered in by Ash Wednesday. For instance, many people will voluntarily give up something for Lent as an exercise in self-sacrifice. It is common for someone to try to abstain from sweets, pop, or similar non-essentials in the days leading up to Easter. Fat Tuesday would be the last chance to enjoy the soon-to-be-forbidden treats. While Mardi Gras technically refers to that specific Tuesday, the word is also used to describe the period of celebration leading up to this day. This larger Mardi Gras typically begins on January 6, the 12th Day of Christmas, known as the Epiphany. This Christian observance recognizes the day the three wise men arrived to honor the baby Jesus, framing the entire event in religious sentiment. When it comes to the big celebrations that have become synonymous with the day, the meaning of Mardi Gras is excess. It's all about spectacle and atmosphere. It's also a time of distinctive foods that have come to mean "Fat Tuesday." New Orleans has long been a tourist destination for its unique atmosphere and culture. However, nothing brings visitors to the city quite like Mardi Gras. The city's celebration of the event is legendary. There's an "anything goes" air among tourists and residents alike. Groups known as krewes create elaborate floats to enter in a series of parades. As crowds line the street, those riding on the floats toss candy, trinkets, and beads to onlookers. There is also a darker side to the celebration with public drunkenness and women lifting their shirts to ask for beads. However, even in the midst of this atmosphere of debauchery, touches of the religious origins of the occasion remain. The king cake, one of the traditional Mardi Gras foods, is named for the three kings, or the three wise men, from the Biblical story of Christ's birth. Part of the tradition of the king cake also involves baking a small plastic baby inside to represent the baby Jesus. Whoever finds the toy is supposed to enjoy good luck and blessings in the coming year. Additionally, among the official colors of Mardi Gras - purple, green, and gold - green symbolizes faith. The word Carnival is used throughout the world to refer to the weeks leading up to Mardi Gras. While specific traditions vary from country to country, it is generally a time of celebration before the sedate season of Lent. The most famous Carnival event is perhaps Brazil's Carnaval. Rio de Janeiro hosts the biggest Carnaval, but across the country, Brazilians take to the streets for parades, dancing, and partying. The largest and most elaborate Carnivals surpass even New Orleans for non-stop festivities. Paczki are Polish donuts, and these fried treats certainly put the fat in Fat Tuesday. They were originally designed to use up lard, fruit, and sugar, substances that were forbidden during the fasting of Lent. They have become increasingly popular in the U.S. over the years and have been embraced as a Mardi Gras tradition. Other cultures refer to Mardi Gras as Pancake Day or Pancake Tuesday for similar reasons. Celebrants would make pancakes in order to use up fat and eggs before giving up these foods for Lent. No matter what your cultural or religious background, it's easy to see that Mardi Gras means fun. Understanding the deeper meaning behind the holiday can only add to your enjoyment of the occasion.